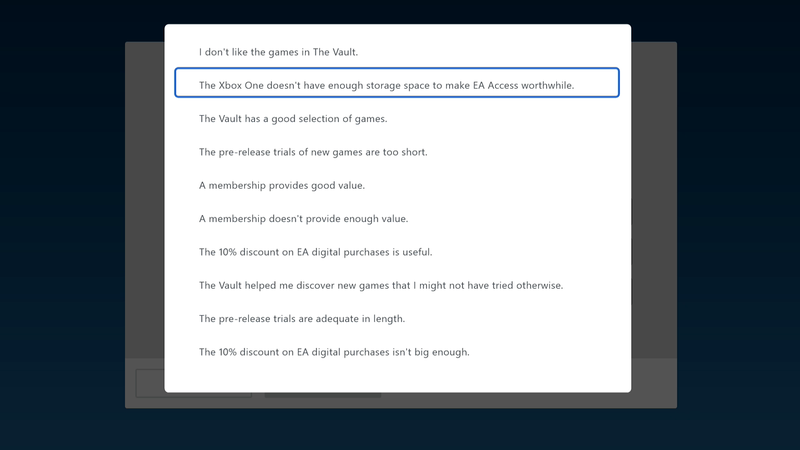 I guess at some point I rated the EA Access service I subscribe to on my Xbox One. I know this, because my EA Access app just asked me to explain my 8 out of 10 rating. That’s not a bad score, right? It’s not like a simple, unvarnished “YES,” but still pretty good. How to explain? My first answer was “I don’t like the games in the Vault.” No offense, sports games! I wish I liked you more, Battlefield Hardline and Dragon Age Inquisition. EA Access is $5 a month, $30 a year and currently enabling me to play Plants Vs. Zombies 2: Garden Warfare days in advance. I feel like I live in the future. Or in Australia, which is similar.